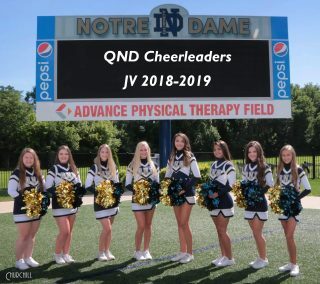 The current program consists of JV and Varsity cheerleaders. 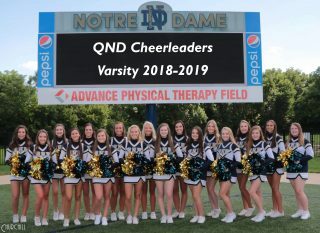 Tryouts are held each spring for the following year for the two squads. Both squads cheer soccer, football and basketball. The girls practice Mondays and Wednesdays after school during the school year. During the summer, they practice Tuesdays, Wednesdays and Thursdays. Every summer the girls attend camp held by the Universal Cheerleading Association. This summer we attended camp at Embassy Suites in Peoria. The girls received top honors for both squads again this year. The girls received the top banana award as well as numerous first place trophies for dance and cheer. Pay it Forward Pin recipients, Jump contest runner-ups, Stunting contest winners, five girls making All American, as well as numerous accolades for their wonderful character and sportsmanship. We have won 3 American School Spirit Award for Academic Excellence and all-around cheer and were ranked 8th and 9th in the nation in the overall contest determined by grade point average, community service, spirit raising activities and recommendation letters. We have performed at the St Louis Cardinals games and the St Louis Rams games. At the Russel Athletic Bowl, we received the Spirit Award out of 20 squads for the girls’ work ethic, leadership, sportsmanship and team spirit and just being a great example for the other squads. We host two kiddie camps a year also for kids 3 yrs to 8th grade. They are held in late July and in January or February depending on the basketball schedule. We also host a Cheerleading Alumni Night every other year and this year it will be held in January! We also have a competition team and will be competing once again this year in IHSA Cheer Sectionals in late January. We have competed in IHSA Sectionals seven times and have competed in IHSA State finals twice. We hope to get the chance to return to state this year! The girls do a lot of community service too. We do the Pack the Pantry Promotion held in November, as well as many other events. We look forward to another year of great cheerleading and Raider Pride!